Yeah, well make that mad dogs and LowRangers now. 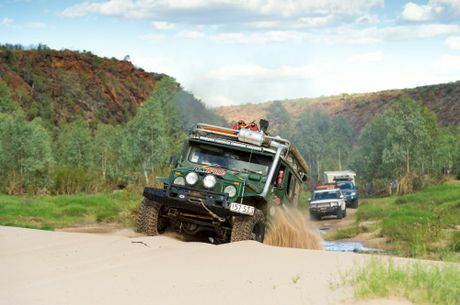 Desert trips in February in Australia are about as sensible as believing politician's promises. But I knew it'd rained out in the centre country and I was dead keen to get a look at the desert in another colour. See, Australia's a wonderful place but part of that wonderment is how much difference a bit of water can make. I've seen the Simpson bloom, been sunk in a gibber plain mudhole, watched the Todd tumble trees and marvelled at rain pouring off Ayers Rock. Rare times to be sure, but very special in that way that welds a permanent file in your memory. But in all my years travelling the centre country I've never seen the mighty Finke after big rains. Usually there's a few bog holes at most apart from the water at Boggy Hole but locals talk of how in flood it rages wide and deep until it carries water all the way to Lake Eyre. You can see the damage flash floods have wrought in the old tree piles but that's about all. For the most part the Finke is an incredible red rocked valley that's dryer than the pub with no beer. Dust is usually the biggest problem here, dust and soft sand. It'd been raining hard up in the MacDonnell Ranges, and the local knowledge was that the Finke track (now called the Finke River 4WD Route) had been closed due to flood. That meant there was a very rare chance with a bit of timing to get into this country and have a look while there was still plenty of water about. Of course the risk was going to be twofold - there'd be too much water and we wouldn't be able to get through, or it'd be too hot. It sure was hot! Almost as soon as we left Boulia and drove west over the Plenty Highway the day's temperatures were running around 45 degrees dropping to a not so cool 30 plus about 3am in the morning. Travelling in Milo, with no air conditioning, was a strange mixture of squirting a spray bottle of water all over myself before enjoying the brief moments before it dried. All flaps, windows, everything was open to grab as much wind as I could but at least, when we stopped, I was ready for the heat. The other guys, travelling in 23 degree plastic air, looked like they'd been hit by a blast furnace every time we stopped. Crossing a wet desert: John Rooth and the boys splash through the newly wet desert in their 4WDs. How do the birds know the water has come? Roothy has a theory. 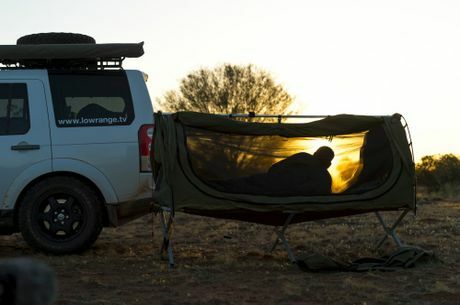 Now the goal was to get through the Finke but first, we had a couple of nights off in Alice Springs. As usual the Transport Hall of Fame was on the visiting list, somewhere I've always figured might be Milo's last stand but until then I'll be quite happy to drive her out of the carpark! Tongue-kissing a roo: John Rooth and the boys have some misgivings as they learn how to take care of a thirsty joey. True to LowRange form we took some time out on our way to the Finke to check out the Henley Meteorite craters which really are a bit mind blowing. It's only the isolation of the central outback that's preserved these craters pretty much in 'as fell' condition and it's weird to think it could happen in the future too. I guess thoughts like that just make you want to squeeze more from life every day eh? Which is what we were out to do down the Finke. But before we do, time out for a bit of an announcement. 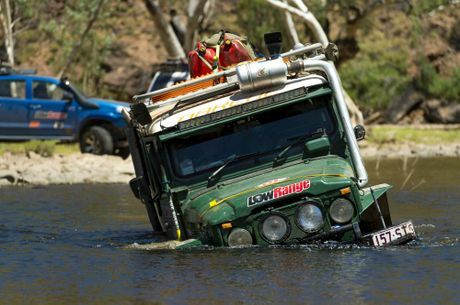 In some states four wheel drive associations, the peak bodies that represent the 4WD clubs, only go in to bat for their paid up members interests, something I've always had issues with because deep down I reckon this country and its tracks belongs to all of us, not just the exclusive few. 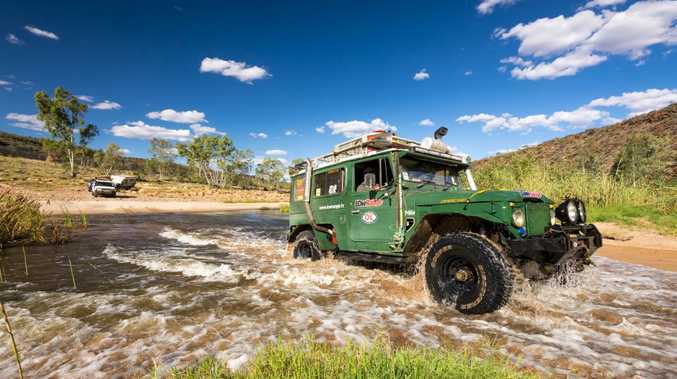 In the Northern Territory, Four Wheel Drive Northern Territory has worked long and hard to make sure that as much of their state as is possible is kept open to all of us who want to explore it. 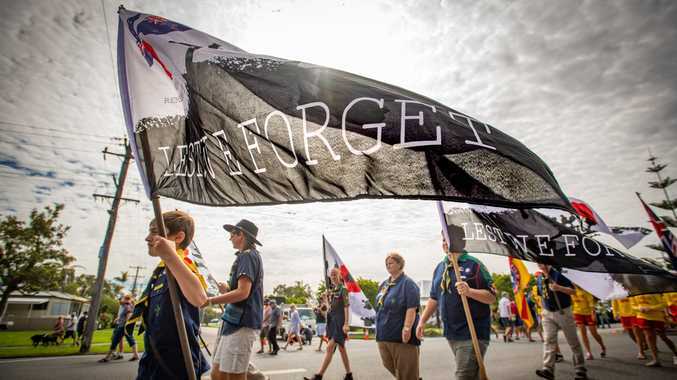 Sure, it helps that in the NT almost everybody drives a four wheel drive, but their efforts have resulted in some real pressure put on governments to recognise our rights. 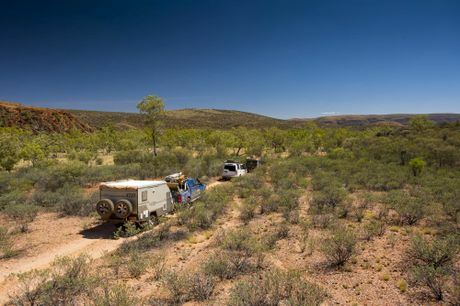 One of these is the access to the magnificent Finke River Track which, in some states, would have been shut down by now thanks to pressure from city based conservationists with no ideas of the reality of the bush. The track's easy to find thanks to the Association's signposting efforts but wow, once in we realised it hadn't seen much traffic - if any - since the big rains. This country is incredible, great big red walls of old rock that have been carved through by millions of years of the occasional raging torrent. The geographical history of the Finke is absolutely ancient. That, and the way the country comes to life after some rain, no doubt all helps make it a truly magical place. With summer peaking and the floods well over a month or so ago we got to see the Finke in a unique state - just driveable, but glorious in its greenery. 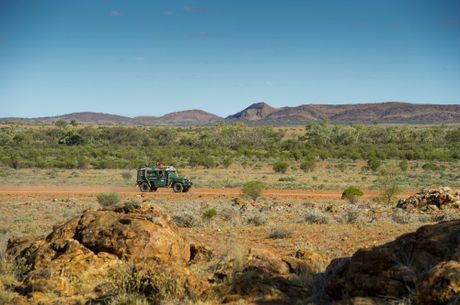 The contrasts between red rock and green grasses, the heat and dryness of the sand flanking glorious waterholes that were shrinking by inches every day, wow, how lucky were we! Until Kenno bogged the XT10. He blames me of course because I'd picked a beaut waterhole with some shady trees for lunch. Unfortunately it was surrounded by banks of fresh washed fine sand and the weight of the trailer and the loaded HiLux meant it was a big job to get Kenno's rig out. We Maxtraxed a few metres each time, bogging down within a few yards of each 'launch'. The sand was so soft we wound up double winching before finally snatching Kenno out on to the harder stuff with a big pull from Glen's Roo powered Land Rover. Winding through the Finke turned into a non-stop progression of dry heat and dust followed by beautifully cooling swims in the water holes and river crossings. At least it did until we got close to Boggy Hole. One of the few 'permanent' watering holes, this is where Constable Willshire established his police camp in 1889 and somewhere around here there's supposed to be some ruins. I've never seen them despite coming through here dozens of times in the last thirty years so now, with LowRange being all about doing the things we've never had the chance to do, I figured it might be time to tick that box. So I spent the next few hours driving around trying to work out where I'd put a police camp if I was a copper on the lookout for 'trouble'. 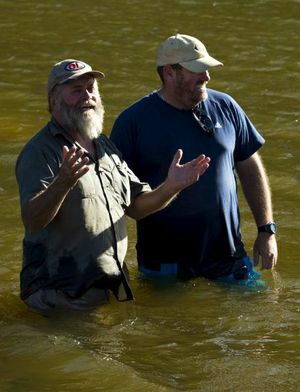 I figured common sense dictated somewhere well out of the river's flood path and with a view down all three valleys and after finding the remnants of an old track I figured I was getting pretty warm. But apart from signs of the old stock keeping days there was nothing remotely like 'ruins'. Should have done some more homework before we left because here, back in the office, it didn't take long to find out that Willshire's 'station' was on the other side of Boggy Hole. I'd managed to go completely in the wrong direction. Mind you, Willshire himself wasn't the smartest or most decent bloke around, he was well known for killing countless innocent Aboriginals and was even taken to court for one 'punitive attack' on a tribal group, but the attitudes of the day and the pastoralists who were losing stock to the Aborigines meant he got away with that one too. 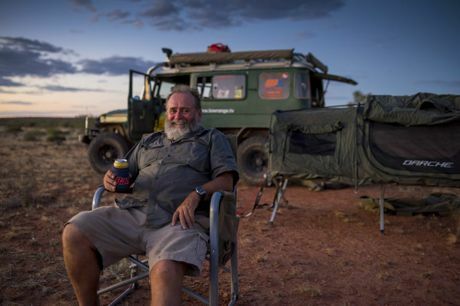 Before we leave the Finke and start the long trek home I'd better tell you about one more incredible part of this journey. Sure, it was rotten hot, so much so that Glen and Kenno had portable 12 volt fans inside their swags because it was even hot at night! Sure, there were clouds of flies. 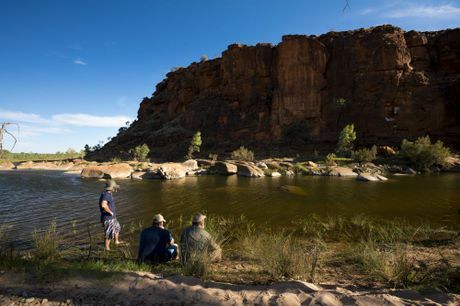 But camped up at night under skies loaded with stars sculptured by ancient rock formations that towered above us on either side, I reckon was about as close to heaven as a bloke can get. Somehow being in such a remote place at a 'remote' season surrounded by a feeling of timelessness that's hard to fathom back here in our alarm clock world, being awestruck by the power of nature was hard to avoid. Maybe you don't want to go do this trip in summer, but for the few who brave it after some rains, wow. What a special heart our country has!